I am a ball of emotions right now. All kinds of them. Sadness. Hope. Awe. Shock. Calmness. Excited. 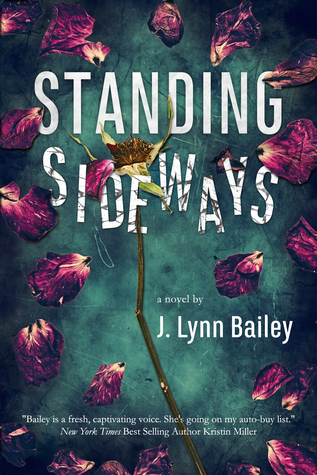 When I opened Standing Sideways I had no idea what to expect as I have never read this author’s work before. But saying I was shockingly pleased would be a tremendous understatement. J. Lynn Bailey completely blew me away. With a sarcastic, in-your-face, and cutthroat narrative, Livia is one of the most interesting characters I have read to this day. Her struggles and her feelings were ones that I feel as if we can all relate to in one way or another. Her coping mechanisms- I’m sure we have all been there. The beauty of it all? Her character growth. Watching her transform into the person she was meant to be was an incredible journey for me. Watching her find her way, the way she needed to and the way she did it (good or bad) was even better. I felt like I was right beside her cheering her on every step of the way. I really enjoyed that the author didn’t base this novel around romance. That is not what Standing Sideways is about to me. Sure, Daniel is a great addition, but it wasn’t an addition that Livia herself needed. She wanted Daniel, but all through out the novel she didn’t need him to do what she had to for herself and THAT is what this book was about. A girl grieving, coping, and healing in a way that didn’t involved any one else but herself. She had support and the people there and she used what she had to but she had to find herself and watching her do that was incredible. This is exactly how I felt about J. Lynn Bailey and her words. I wanted to get lost in them. I wanted to be buried in them. I wanted to be trapped in a dark room with them. They were just…exceptional. That’s just the only way I can put it. I have this five-star review, something I hardly ever write and I have this immense love for this book I just discovered but I’m still wondering about a few loose ends. I won’t acknowledge them in the review in fear of spoilers for others but I do wonder how a couple of things panned out and what happened to a couple of other things as well. But ultimately- that didn’t deter my love for the story and the message the author was portraying to her readers. The story itself was so compelling and raw. The way that the author portrayed not just Livia’s grief but others as well was told in a way I hadn’t read before. It was heavy. I could totally settle for a Daniel book. Or even a Cao one. But I’m so happy I experienced this read. I’m just so happy. Thank you to NetGalley for the ARC. You did me a solid on this one.